My mom has a very pretty set of glass dishes for banana splits. The thing is, she hates bananas. A lot. Always has. So how did she acquire an entire set of dishes just for bananas? Let’s not dwell on questions we’ll never answer. The point is that we’ve got this set of very specific dishes, so I started trying to think up a way to make them useful. That’s how the kielbasa split was born. 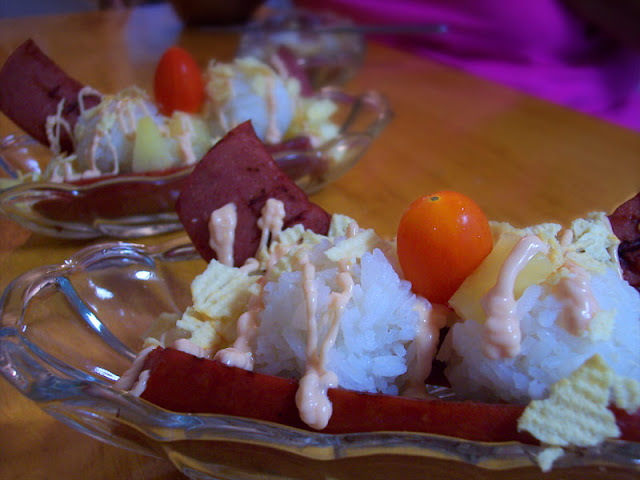 It uses turkey kielbasa in place of bananas, and sticky balls of jasmine rice instead of ice cream. It’s topped with chunks of pineapple, crushed up potato chips, and a drizzle of pink sauce. It looks cute, sort of like a banana split, and it’s really simple to put together. The big surprise? It tastes good. The odd combination of pineapple, pink sauce and potato chips was inspired by Super Perros, a popular little restaurant near Florida State University, so you don’t have to take my word for it. Ask Tallahassee. The rice was Mom’s idea. I was having trouble coming up with a ball shape. And jasmine rice, what with it being delicious, is a really tasty replacement for the bun you might normally have with kielbasa. As for the sausage, use the sausage you like. Turkey kielbasa is milder-tasting than the ordinary kind, so real kielbasey-eaters might prefer something more traditional. Kids might rather have a hot dog. A bratwurst would be fine, too. But if you’re asking me, I think turkey kielbasa. Cook the rice according to the package directions. Remove it from the heat and leave it uncovered to cool off. Make the pink sauce. In a small bowl, mix the ketchup with the mayo. Put the mixture into a Ziploc bag and cut a tiny piece off the corner of the bag, for piping. Put it together. Place two pieces of sausage into each banana split dish. With your hands (and an ice cream scoop if you like), mold the rice into balls that are about the size of a scoop of ice cream. 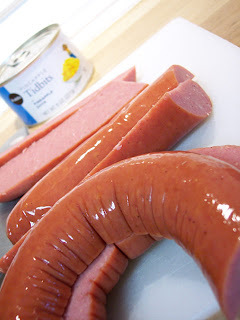 Place two of these into each dish, between the kielbasa pieces. Sprinkle some pineapple pieces on top of the rice and kielbasa. Drizzle some pink sauce over that by gently squeezing the Ziploc bag. Crumble two or three potato chips over each dish, and place a grape tomato on top like a cherry. Voila! Serve immediately, so it won’t get cold. ← Simple and snappy: Sausage and Pappy! …ers! Kristina Ackerman is a busy freelance web designer, living and DIYing with her fella and their little fella in a cute old house in Atlanta, GA, USA.